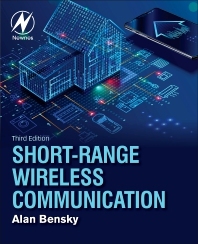 Short-range Wireless Communication, Third Edition, describes radio theory and applications for wireless communication with ranges of centimeters to hundreds of meters. Topics covered include radio wave propagation, the theory of antennas and transmission lines, architectures of transmitters, and radio system design guidelines as a function of basic communication parameters, such as sensitivity, noise and bandwidth. Topics new to this edition include MIMO, metamaterials, inductance coupling for loop antennas, very high throughput Wi-Fi specifications, Bluetooth Low Energy, expanded coverage of RFID, wireless security, location awareness, wireless sensor networks, Internet of Things, millimeter wave and optical short-range communications, body area networks, energy harvesting, and more. Engineers, programmers, technicians and sales management personnel who support short-range wireless products will find the book a comprehensive and highly readable source to boost on-the-job performance and satisfaction. Alan Bensky is an electronics engineering consultant with over 30 years of experience in analog and digital design, management, and marketing. Specializing in wireless circuits and systems, Alan has carried out projects for varied military and consumer applications and led the development of three patents on wireless distance measurement. Alan has taught electrical engineering courses and lectures on radio engineering topics and is the author of two books: Short-range Wireless Communication, Second Edition, published by Elsevier in 2004, and Wireless Positioning Technologies and Applications, Second Edition, Artech House, 2016. In addition, he is a contributing author to five other books dealing with wireless communication. Alan Bensky holds degrees of B.E.E and B.A. from Union College, Schenectady, New York, and M.Sc.E.E. from the Technion in Haifa, Israel. He is a senior member of IEEE and an IEEE certified Wireless Communications Professional.